Historically, metal forming has always been a major concern for humans in their quest to craft different kinds of objects, weapons, tools, and so on. 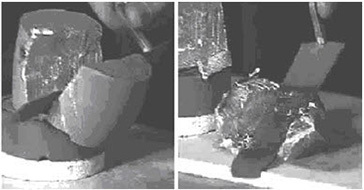 Different techniques for metal forming have been developed, and many of these can be classified into two main categories: casting and forging. Casting: The metallic alloy is first heated up to its melting point, and then the liquid material is poured into a die so that it takes the desired shape. The biggest part of the energy consumed in the process concerns the heating of the material. This kind of process allows production of a large variety of complex geometries, most notably thin-wall components that allow the manufacturing of lighter parts. 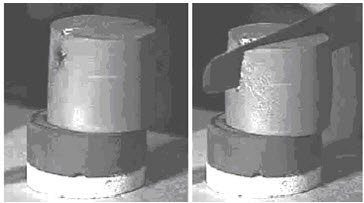 However, during solidification, the material tends to shrink, and this inevitably leads to porosity that weakens the mechanical properties of the final product. Forging: The alloy is kept in the solid state and is deformed into the desired shape. In this case, the consumption of energy is mainly due to the load necessary for producing the prescribed deformation. This kind of process can offer a very good level of mechanical properties but is limited to simpler geometrical designs than with casting. Moreover the waste of material is higher than that in casting. Semi-solid thixoforming: Is an intermediate process. It relies on a particular behavior that can be exhibited by semi-solid materials. These materials display thixotropy, which is characterized by a solid-like behavior at rest and a liquid-like flow when submitted to shear. This behavior is illustrated in Figure 1 where the metal can be cut and spread as easily as butter. Semisolid state processing can be categorized in to two development routes: the thixo-forming route and the rheo-casting route. Thixo-forming is the general term for the process of forming the final parts from semisolid state materials, with the help of the metallic dies/forms and the top die. If the part is obtained in a metallic closed form, the method is called thixo-casting, and if the part is obtained in an open die, it is called thixo-forging. 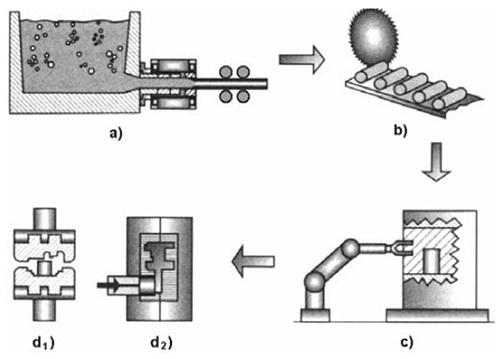 Figure 2 is presents a scheme of the thixo-forming process, where the processing stages are pointed out: elaboration and casting of the ingots (a), cutting of the ingots in the semi-finished products (b), reheating of the semi-finished products (c) and forming: through die-forging (thixo-forging) (d1) or through casting (thixo-casting)(d2). The main specific advantage of the thixoforming route is that the forming facility is free from handling liquid metal, and the process can be highly automated using approaches similar to those employed in forging and stamping. This basic concept of completely separating the two main parts of the process (forming of the desired structure and component forming operations) has been intuitively appealing and much work has been done in developing this process route industrially. As time progresses, the disadvantages of the thixocasting route are also becoming apparent. It has been difficult to obtain fully homogenized billets in MHD stirred continuous castings. Typical billets have some degree of inhomogeneity with respect to both structure and composition. There is metal loss during the reheating process, which may amount to as much as 10% of the total part weight. Gates and risers cannot be recycled within the forming facilities, but must be sent back to the ingot producer. Thus, the metal former pays a premium to the continuous caster not only for the unique thixotropic structure in the metal, but also for the recycled materials. Currently, the cost for thixotropic feedstock could account for up to 50% of the total component cost.